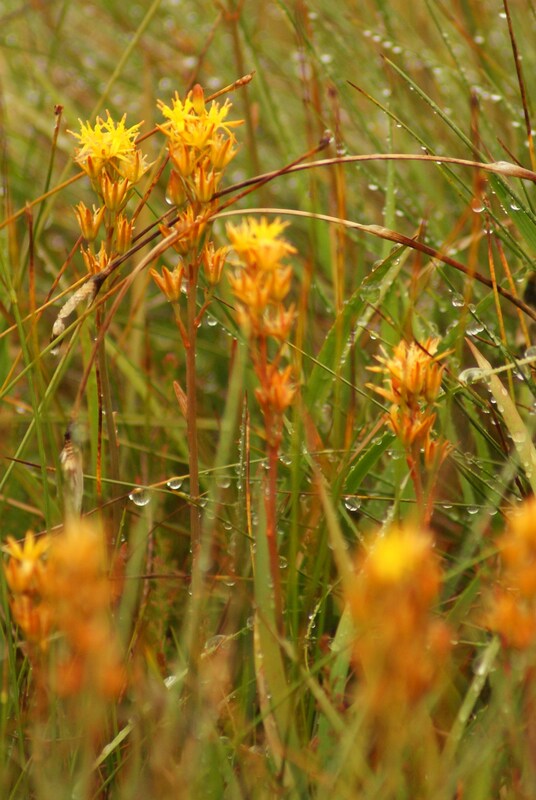 Bog asphodel is thriving in the heather enclosure. When I fenced off an area of the hill and prevented it from being grazed in February of last year, I had no idea how fascinating the half acre of apparently dead vegetation would become. Within weeks, I began to notice a difference between the area inside the rylock netting and the area outside. Over the last two summers, the heather has staged a fantastic recovery, and some plants have grown more than eight inches. The red tendrils of fresh growth are now just beginning to show tiny white buds, and it is without exaggeration one of the most exciting and satisfying projects I have worked on since I began on the Chayne. In a week, the space will become totally purple, and I will post pictures on this blog to show how dramatic the changes have been. The heather is not the only plant to have felt the benefit of the grazing ban, and several other species have showed a marked improvement in condition since they were fenced off. Cotton grass is abundant, and meadow flowers like ragged robin have become runaway successes. The most noticeable plant at the moment is bog asphodel, which is growing with concentrated enthusiasm inside the enclosure, and the pretty yellow flowers have formed a low carpet across the ground. When asphodel dies back in the autumn, the stiff little shoots and flowers remain in place throughout the winter, standing like brown skeletons all year round. As soon as I can get on to the grazing situation on the hill, the sooner the entire property will take on a new lease of life. It would be easy to say that the answer to the Chayne’s problems is to cut out the livestock, but given that tiny sitka spruce trees are also beginning to appear in the heather enclosure, I can see that the sheep and cows are serving a purpose by holding the moor back from becoming a forest. There is a balance between protecting the heather and using livestock to prune the undesirable vegetation, and finding it should be my next priority. Just thought that it would be worth including this incredibly lucky photograph, which I took this evening through my car window. The jay flickered over the road infront of me on my way back from work on the coast, and he stopped for a second in the branches of an ash tree before vanishing again. I’ve shot my fair share of jays, and it’s always great to hear them screeching in the oaks in October, but it would be hard to imagine a harder bird to photograph. They are so secretive and are always on the move, so to have taken a close up portrait that is actually in focus says more about the fact that I keep my camera on the passenger seat whenever I go anywhere than it does about any of my own technical skill or ability. A light sussex x silkie bantam - perfect for brooding whatever it is I plan to brood. Having seen how black grouse can be reared in captivity and presented with the opportunity to do it myself, I need to start planning the actual process. 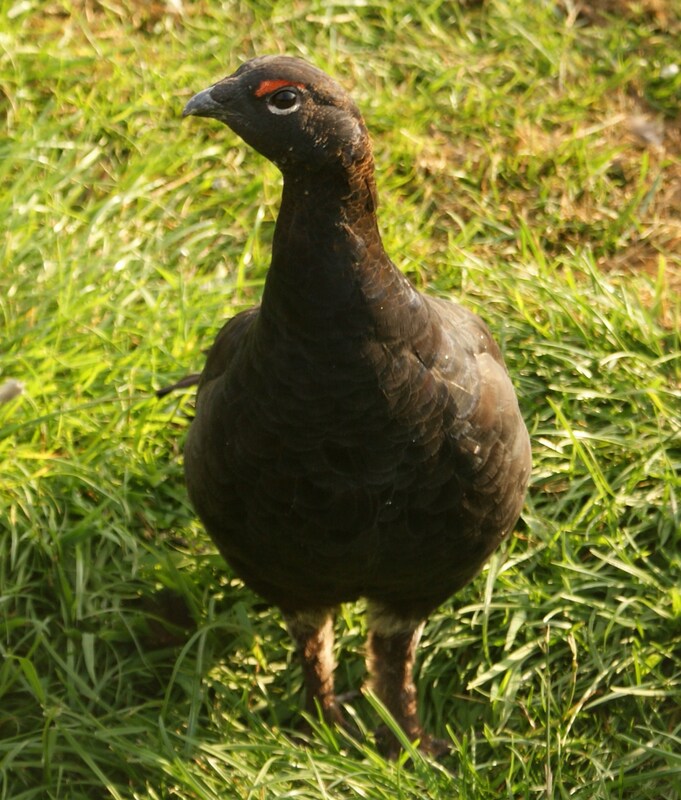 There is not a huge amount of technical equipment involved in keeping black grouse, and besides the creation of a totally fox proof enclosure, I can look forward to taking on the poults in September without too much stress. Looking to the longer term, breeding looms large as one of the most exciting and fascinating processes on the horizon, and despite the fact that there are still several months before eggs are produced, it would be foolish not to make some plans for brooding and incubation. Having come across young black grouse being reared by bantams on Arran last year, it makes sense to use birds of my own to hatch and nurse any potential chicks which may or may not appear. 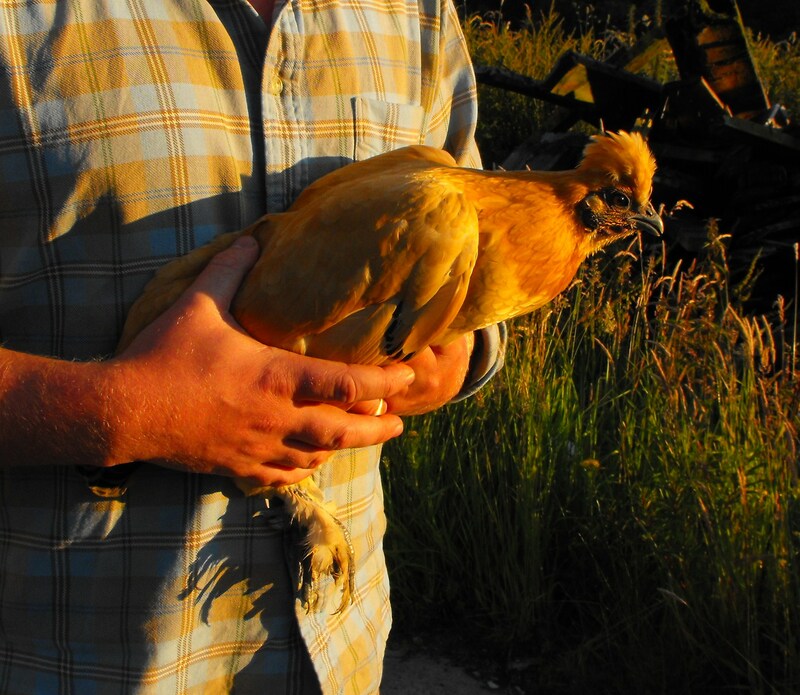 Lacking any access to bantams of my own, I bought two silkie x light sussex bantams at the weekend. They are curious birds, with silly pom-pom hair styles and attractive honey coloured plumage. Unlike many hens I have come across, they are pleasantly sedate, and I hope to get them to stage at which they can be handled and moved around without too much fuss. Bantams are well known for their efficiency in brooding and rearing chicks, and silkies in particular are often excellent mothers. I’m not wild about poultry, but if these birds perform their function by brooding and rearing black grouse chicks, then I’ve got no doubt that they’ll win themselves a place in my heart. It’s a very long way to Oxford, and it’s about the same distance back again. I am quite new to the CLA game fair, and last year was my first year. Overwhelmed as I was by the sheer scale of the show at Ragley Hall and by having accidentally bought ferrets, I headed south this year with an air of trepidation. I had no idea what to expect, and having slept (or failed to sleep) in the worst hotel in the British Isles the night before, I was not feeling particularly strong or able to deal the inevitable hustle and bustle of the world’s biggest game fair. As soon as I walked through the main gates, I was swallowed into staggering crowds and an oppressive heat which, being a scotsman, made my knees buckle. Within a couple of hours, I had bought up batches of ferret purse nets and had made arrangements to buy a long net system. I had visited the book shop and left with all kinds of reading material, then had been consumed by the food hall. It was, as last year, a totally draining and financially suicidal situation to have put myself in, and I looked on passively as I haemorraged money across the stunning parklands of Blenheim Palace. By five o’clock, I was exhausted and broke, but satisfied at having performed surprisingly well during my annual bout of retail therapy. 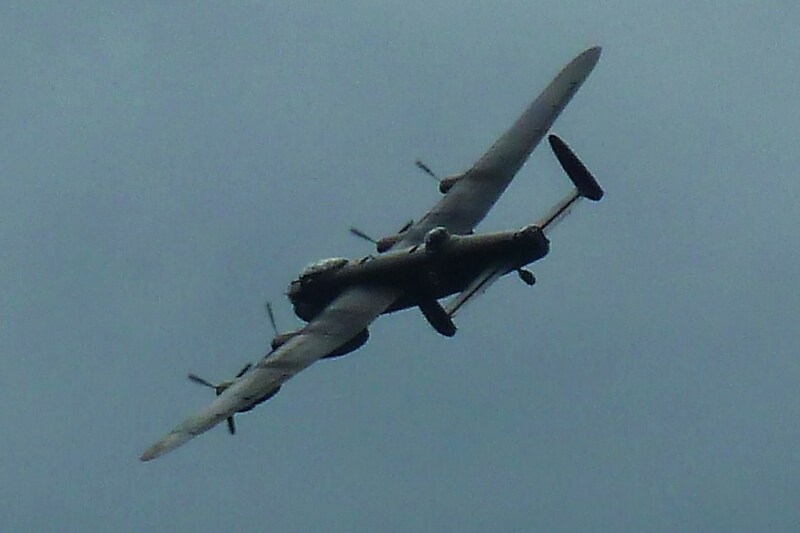 Used to checking snares, lying out for foxes and walking the hill, seeing thousands of people and being buzzed by an avro lancaster amounted to some form of psychologically damaging sensory overload, and as I headed home, I was quite grateful that this fantastic and collosal experience only takes place once a year. 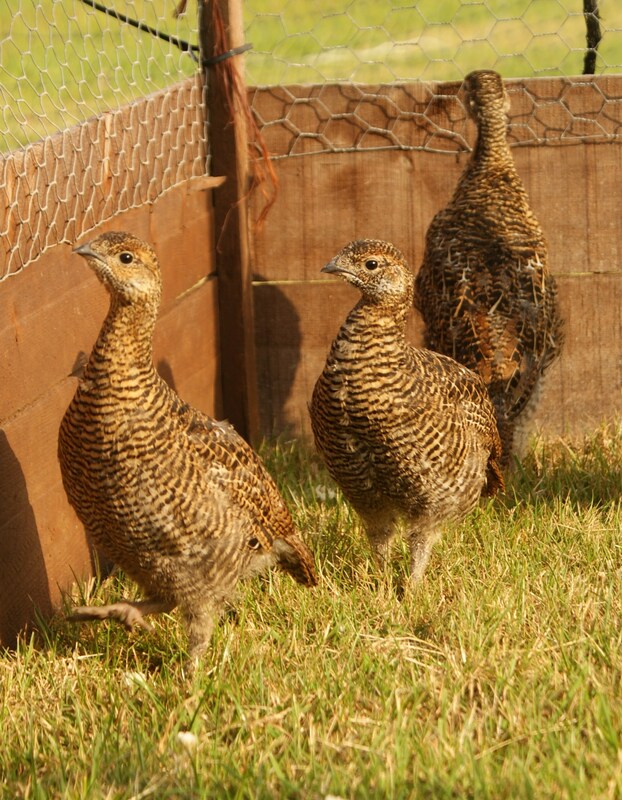 Black grouse poults, bred and kept in captivity. Good habitat management and careful strategy could make all the difference on the Chayne. It was a huge pleasure to visit a reader of this blog on Thursday, when I was shown what it takes to breed and keep grouse in captivity. After a productive spring, black grouse chicks strolled happily through the long grass inside their pens, cheeping and being clucked at by their respective bantam surrogates. Red grouse called from a seperate enclosure, and a pair of capercaillie peeked out from the back of a thick and overgrown pen. Grouse have the reputation of being nature’s untouchables. General consensus dictates that if you take a grouse of any colour or species out of the wild, it will quickly fade and die. What I saw on Friday showed that not only can you keep birds in captivity, but they can actively thrive, breed productively and go from strength to strength. After having recently Posted on the subject of introducing supplementary bloodlines to the dwindling birds on the Chayne, I can see real possibilities for keeping and breeding black grouse of my own. The problems traditionally associated with reintroduction would be negated by a series of releases to bolster an existing population of birds rather than create a new one from scratch, and if I could get it right, a sustained release of birds could well resurrect Galloway’s black grouse from the ashes. There would be no point in freshening bloodlines if I don’t get the habitat right. I have black grouse on the hill, and habitat improvement along the lines of what I have done and what I plan to do will certainly make a difference to them. However, there is more than just poor habitat behind the collapse of Galloway’s black grouse. My concern is that my birds will soon become so isolated and inbred that by the time the heather is in a good enough condition to support them, they will be genetically exhausted and unable to fill the gap. I don’t propose to release black grouse into a habitat that is unable to support them, because this would doom the birds to failure. As I see it, supplementary releases could take place on moorland that is returning to a healthy state, and artficially reared birds would perform an auxiliary role for the benefit of the black grouse already on the site, freshening bloodlines and contributing to the viability of the locals. Whether or not reintroduction from scratch is a viable way of resurrecting lost black grouse populations remains to be seen, but using artificially reared birds to boost a failing wild population has never been attempted, and it seems too good an opportunity to miss. Just thought it was worth posting this picture of one of my two new ferret kits playing with the cap from a can of shaving foam. She was dumped in the bath to amuse herself while I dealt with the pheasant chicks which are settling in to their new home in my sitting room, and when I came back, she had the cap stuck on her head. I reached down to take it off, but it fell off before I got close. 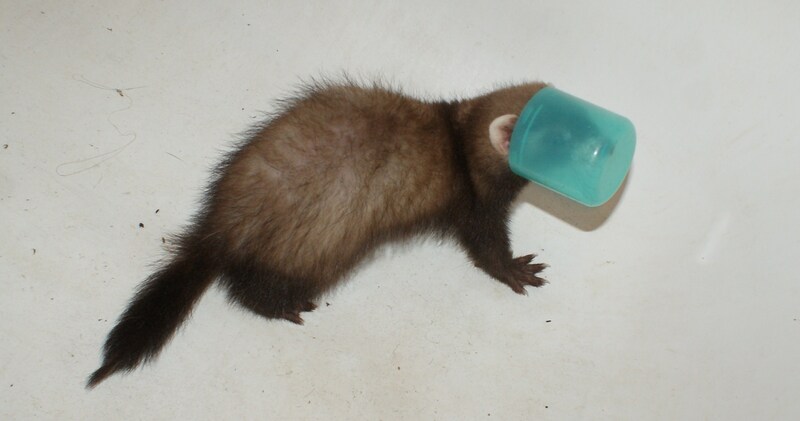 Startled, the kit (named Shredder) instantly jammed her face back into the plastic lid and walked around with it as if it was some kind of space helmet. She was clearly enjoying herself, so I left her to it and took some photographs. Every time it fell off, she shoved it back on again with great enthusiasm, setting off on a victory lap of the bath. I’ve been living in a house without a television for eighteen months now. The absence of telly was very conspicuous for the first few weeks of withdrawal, but since then, I have hardly noticed. With pheasants and ferrets bedlaming around the house (in seperate rooms, obviously – that’s not a lesson I need to learn at first hand), it’s hard to imagine how I’d ever have time to watch television now anyway. This little guy and thousands of others like him provide daily meals for dozens of species on the Chayne. Over the past two years, I have learned a great deal about moorland ecosystems. Everything is irrevocably linked together by mutually dependent relationships, and food chains are extremely complicated. With the exception of top predators and generalists, if one species gets out of hand, mechanisms will click into place to redress the balance and supress the advantage. It is one of the great beauties of moorland management, and the scope and scale of the process is breathtaking. At least, it is to me. For the actual participants in this struggle for survival, life is probably less interesting and far more terrifying. Particularly if you have the misfortune to be at the bottom of the heap. The Chayne is dominated by white grasses and moss. Hundreds of acres of hill ground are dedicated to a bland mixture of uninteresting plant life which is characterised by its inability to support a wide variety of animal species. The only things that prosper in a molinia dominated sward are meadow pipits and their mammalian equivalents, voles. These two species are the ubiquitous fall guys upon which a huge variety of predators base their lives. 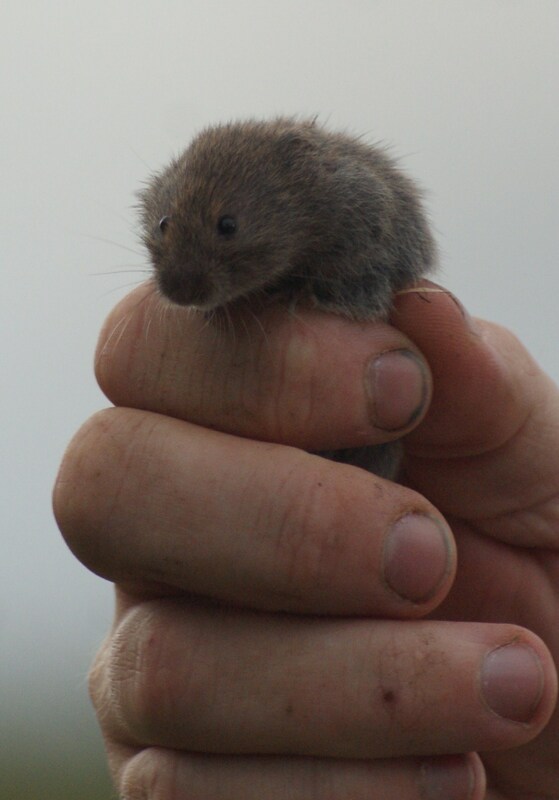 Short tailed voles provide food for every carnivore in the southern uplands, and some species, like short eared owls and adders, base the majority of their menu plans upon these unfortunate beasties. When I found a vole beneath a sheet of corrugated iron this afternoon, I couldn’t resist having a closer look at nature’s whipping boy. He was essentially a fluffy cylinder of calories, passive, inoffensive and just waiting for a stomach to digest him. It seemed hard to imagine that without him and his kin, many more conspicuous species would struggle to survive, but voles perform the vital function of turning grass into meat, and that is his sorry lot. With the world set against him and an enemy lurking behind every corner, I released him back into the wild. I wished him luck in the certain knowledge that this hapless comestible was going to need it.